In a time when the number of hacking attempts and fraudulent activities is increasing with each passing day, website owners and online clients have turned out to be substantially more concerned about their security. As an outcome, having an SSL certificate installed has turned into an essential requirement for any website. Also, the search engines like Google have been urging website owners to secure their website by installing an SSL certificate. Some have even rolled out improvements to their search algorithms to promote secured websites. Moreover, on 25th July 2018, Google made a step further by updating their Chrome browser to explicitly notify visitors when they have arrived on an unsecured website. With such a significant number of measures set up, an unsecured website without an SSL has a lot to lose. There are two types of SSL certificates, both free and paid, that you can install on a website. 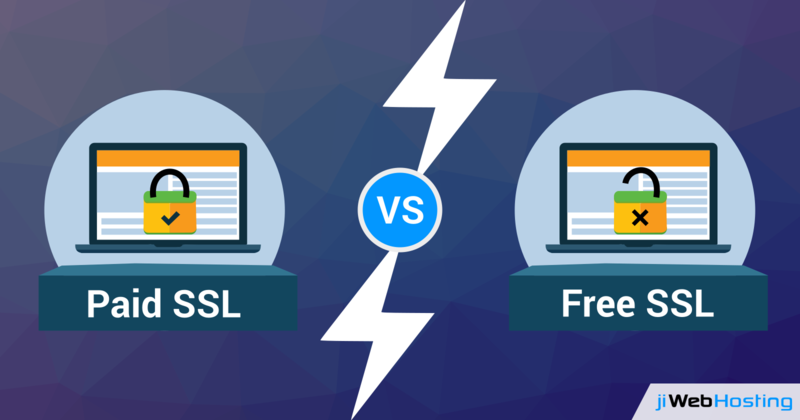 While the level of encryption is the same for both, free SSL certificates accompany a couple of limitations. Validation: Free SSL certificates consists only of Domain Validation which gives a very basic level of validation. The Certificate Authority automates the method of verifying if the applicant owns the domain. Free SSL certificates are perfect for platforms like personal websites and blogs. On the other hand, with paid SSL certificates, the Certificate Authority is in charge of manually checking the identity of the website owner before issuing the certificate. Paid SSL accompanies provisions for Organization Validation (OV) and Extended Validation (EV) certificates. Other than owner identity, OV and EV certificates require an intensive confirmation of the organizations which is conducted by the Certificate Authority. On the off chance that you are a business and need to increase the trust of your clients, a paid certificate is what you require. Warranty: When you select a paid SSL certificate, you are generally covered by a warranty. This warranty goes about as a protection against any harm to the business coming about because of a flaw in the certificate. e.g. data breach. The warranty level ranges from $5000 to $1 Million, depending upon the kind of SSL certificate you have purchased. Unfortunately, there is no warranty with a free SSL certificate. Validity: Generally, free SSL certificates are issued for 30 to 90 days. This implies you should renew your free certificate regularly, which can be a significant issue. On the other hand, paid SSL certificates can be issued for a time of 1 to 2 years which lessens the number of times you should renew your certificates. Trust: With paid SSL certificates come visual indicators like a lock sign or a green address bar and better site seals. These visual pointers guarantee your visitors that they are on a safe website and builds trust. Free SSL certificates do provide 'https://' however the visual pointers that build trust are absent. Support: With a free SSL certificate, you get almost no support from the Certificate Authority. On the other hand, Certificate Authorities and their resellers issuing paid SSL certificates give premium support to all their clients. Server Compatibility: Paid SSL certificates are good with most hosting services including dedicated servers and are simpler to set up. Free SSL certificates are simple to install if the hosting provider has made provisions to help it. So does it bode well to pay for SSL certificates when there are free ones available? The answer relies upon the type of website and how much you value your visitor or customer's trust. If you have a personal website or a blog, at that point you can look at using the free SSL option. However, eCommerce and business websites should not think twice before putting resources into a paid SSL certificate. We hope this article helps you choose what sort of SSL certificate you should get for your website. At jiWebHosting, we give premium SSL certificates from an eminent Certificate Authority called Comodo. If you have more inquiries regarding an SSL authentication then you can talk to our sales team or call on +91 9569227788.